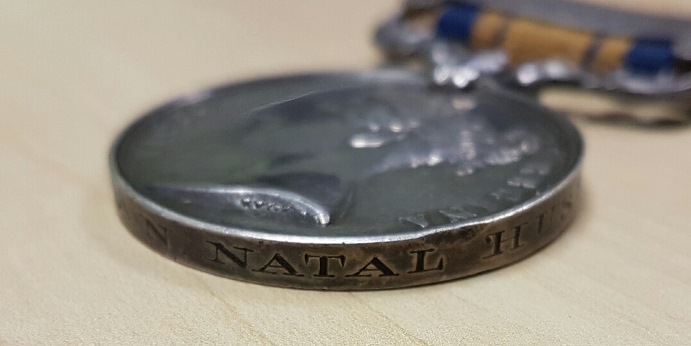 Medals to members of the Natal Hussars are very seldom seen - I am privileged to own this one. 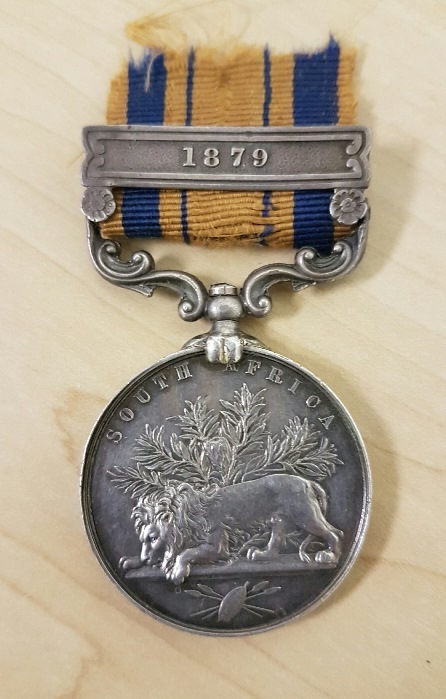 -	South African General Service Medal with clasp 1879 to Tr. Vlotman, Natal Husrs. 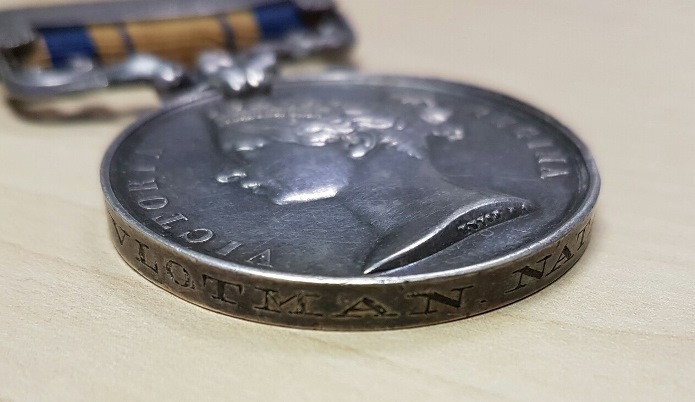 Very little is known about Vlotman which is why this work will focus on the regiment, and the role it played in the Zulu War, rather than the man. To this end the late Terry Sole’s work on the Colonial Regiments, For God, Queen and Colony, has proved invaluable and is heavily relied on for the details provided. Vlotman was most likely one of the men in this photo. 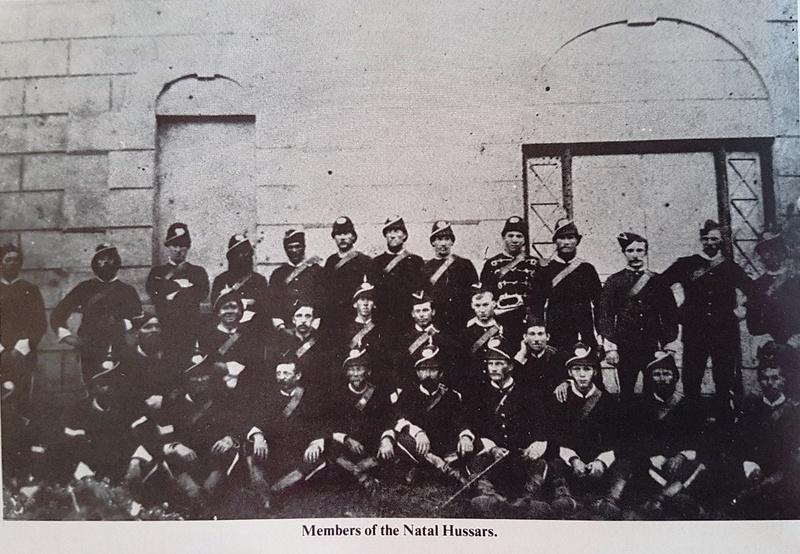 Formed on 11 July 1865 the Natal Hussars came into being for the protection of the districts of Greytown, York and Noodsberg in the Natal Midlands. They were a smaller unit that their sister regiment, the Greytown Mounted Rifles, surviving a period between 1864 and 1872 when many of the smaller units of the Natal Volunteer Corps were disbanded due to austerity cuts. During this period the Hussars experienced a drop in numbers but remained an effective unit throughout. In 1868 they numbered 70 but had reduced to 65 the following year despite an amalgamation with the soon to be defunct Greytown Mounted Rifles referred to. 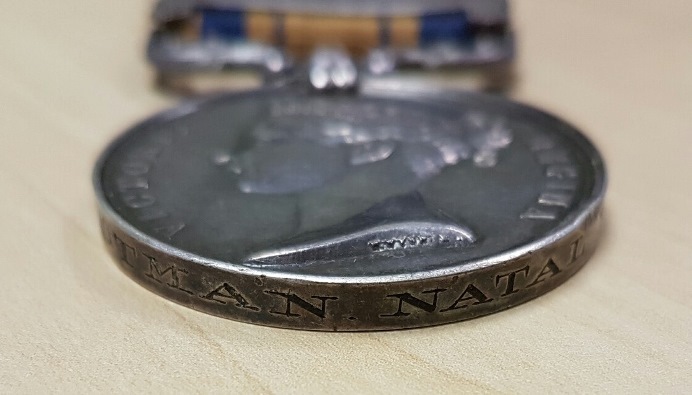 The unit was mobilised on 25th November 1878 with 35 men under Captain Norton marching out from Greytown on the 3rd of December to Potspruit near Kranskop where they were joined by the Durban Mounted Rifles. During the first week of January 1879 these two colonial regiments were joined by the 3rd Regiment (The Buffs) and marched to Thrings Post where they fell under the orders of Captain Barrow who commanded all troops at the Lower Tugela. The Hussars reached Fort Pearson on 10 January and were brigaded with the Alexandra Mounted Rifles, the Durban Mounted Rifles, the Stanger Mounted Rifles and the Victoria Mounted Rifles. On 12 January, Person’s No. 1 Column crossed the Tugela River and commenced building Fort Tenedos on the Zulu side. This fort was completed on 17 January with the cavalry constantly on patrol and on many reconnaissances into the heart of Zululand. One such reconnaissance took place on 15 January the men foraging nine miles into Zulu territory without discovering any enemy force, with the exception of a dozen warriors who threw down their shields and assegais when confronted by the sight of the troop. The Natal Hussars pounced on them taking five prisoners. With the completion of Fort Tenedos it was possible to commence the advance on Eshowe taking along a large supply of transport and stores. Here it must be mentioned that Pearson’s Column was but one of a three pronged attacking force designed to bring the Zulus to heel. War clouds had been gathering for quite some time and this spilled over into open conflict between Britain and the Zulu Kingdom in January 1879. Pearson had been instructed to establish a fortified forward post at Eshowe with the column moving forward in two sections. On the 21st January the Natal Hussars were ordered to reconnoitre Umgingindlovu kraal but, finding it deserted, they burnt the grass huts and returned to camp at Kwasamabela where the column spent the night. At 5 a.m. the next morning the column moved off blissfully unaware of the impending fate of their comrades camped at Isandlwana. “Over the hills came several thousand blacks, uttering their war-cry, and rushing down on the unfortunate native levies (the N.N.C.). It was here that the five white men of one company lost their lives. Major Barrow disposed of the force under his command, and checked the advance of the enemy. The mounted infantry and the Hussars took the right of the road, and the Victoria and Stanger squadron the left. The first shot was fired about 8 a.m. and by 9 the hottest fire was over, and the kafirs retiring. It was at this point that all the casualties occurred. The mounted volunteers kept up the credit of the colony; the Umvoti Hussars (Natal Hussars) had a hotter corner than the Victoria Squadron, and the latter were ordered to protect a valley on the left of the knoll, and clear the Kafirs away from a kraal near the road, where they were swarming in great numbers. This was done very successfully and with a steady telling fire. The kafirs stood the fire for about three minutes then made a clear bolt for shelter leaving many dead around the kraal. The enemy retired and the troops extended in skirmishing order in pursuit, driving the enemy before them. “During the time we were beleaguered one of the Natal Mounted Hussars and one of the mounted infantry, whose names I will not mention, were tried by court martial for cowardice. The following are the facts as near as I have been able to glean them: The two prisoners and Private Kent were sent out to vidette duty in a certain direction. Five armed kafirs suddenly rushed out of the bush and attacked Kent. The two prisoners witnessed the attack, but instead of going to their comrade’s assistance they hurried back to the Fort to report the occurrence. They were told that they should have stood by him, and both were made prisoners. A company of the 99th was immediately sent out after Kent, who was found lying dead with seventeen assegai wounds on his body. “At Kranskop we were told Major Twentyman proposed making a raid into Zululand, and that he wanted some volunteers to cross over with him. We then proceeded down the steep sides of the Tugela Valley leading our horses the greater part of the way, over boulders and under thorns. It was dark before our camping ground for the night was reached about a mile from the drift, in a sheltered valley with any amount of beastly thorns and knobby stones. By morning star we moved down to the river, arriving there shortly before daybreak. Just as the sun rose, an advance into the river was made by about thirty volunteers under Sergeant Duckham of the Natal Volunteers. When the party got to the island in the middle of the drift, there was some difficulty in tracing the ford across to Zululand. Whilst this was being seen about, a volley was fired by about a dozen Zulus. After the raid the force returned to Kranskop where a party of the Hussars rode to Riebeling’s mission station to bring the Missionary and his family to safety. 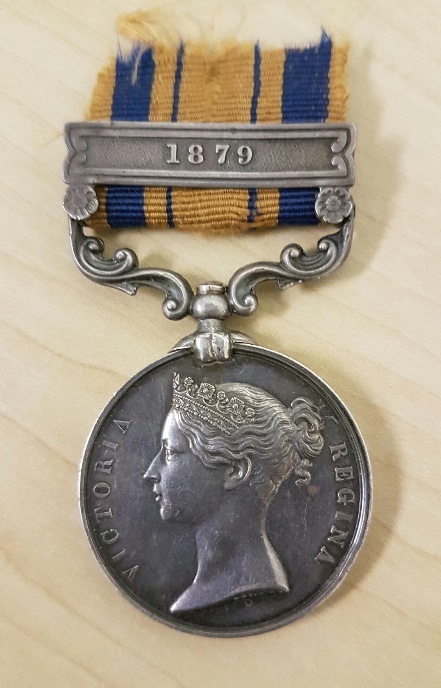 The Hussars spent the rest of the war carrying out their duties to the satisfaction of all and were awarded forty South African General Service Medals with the 1879 clasp. “We the undersigned, inhabitants of Greytown and the County of Umvoti, desire now, on your return to your respective homes, after a long service of eight months in the field, in the defence of your country, to express our sincere and hearty appreciation of your gallant conduct through many hardships, at the risk of life, and at considerable material loss. We especially call to mind your cool and brave conduct at the battle of Inyezane in which you bore a manly and conspicuous part side by side with the Imperial troops, defeating the enemy under great disadvantages, and at the conclusion of the engagement receiving the special thanks of General Pearson. We now bid you welcome with grateful hearts.